A bald eagle is being treated for injuries in the nation's capital, just in time for Fourth of July celebrations. The bird of prey was found Saturday afternoon in poor shape following a series of thunderstorms. 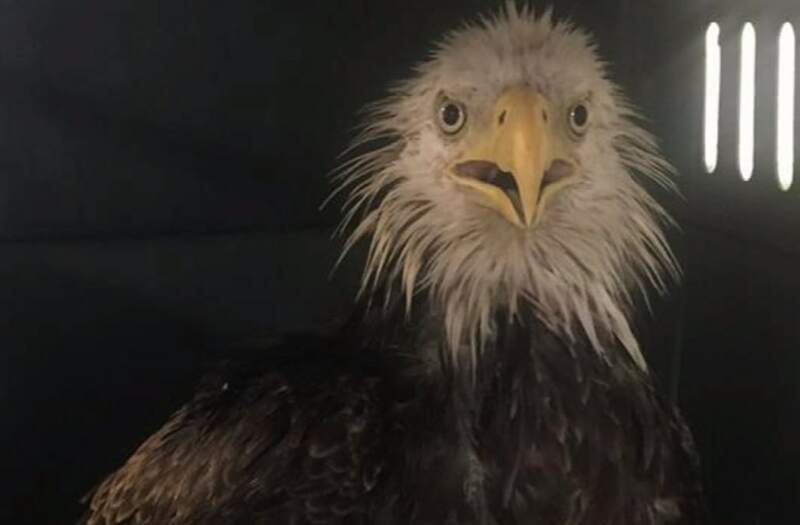 "The adult bald eagle was demonstrating labored breathing, lethargy and was unable to fly," the Humane Rescue Alliance, who responded to the eagle, wrote in a Facebook post. The bird was then transferred to City Wildlife, the rehabilitation center that later determined the bald eagle was grounded from its soaking feathers, but otherwise fine. "It is in good body condition and eating well," they reported. The bald eagle is continuing to recover at their facilities and will be returned to the wild once it has been medically cleared, officials said. The recovering bird is suspected to be Justice, the male of a famous bald eagle couple who have made their home in an oak tree at the Metropolitan Police Academy in Washington, D.C. over the last 11 years. Officials determined it may have been Justice due to its weight and talon size, but neither bird is tagged so making a positive determination would be impossible. Liberty, a female eagle, is the other half of the known couple. Mr. President and First Lady are the other bald eagle couple famous in the capital. They have made their home across town at National Arboretum, further north from where the injured eagle was found.